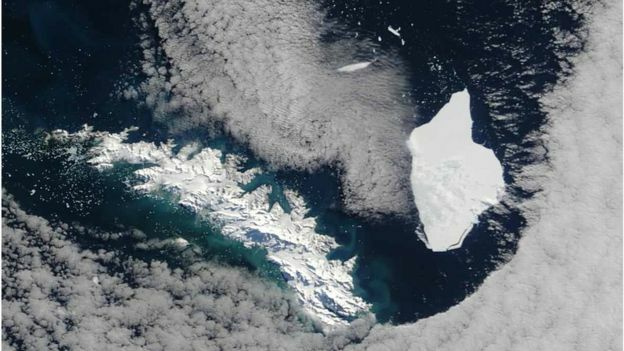 The crack that looks set to spawn a giant iceberg in the Antarctic has continued to spread. 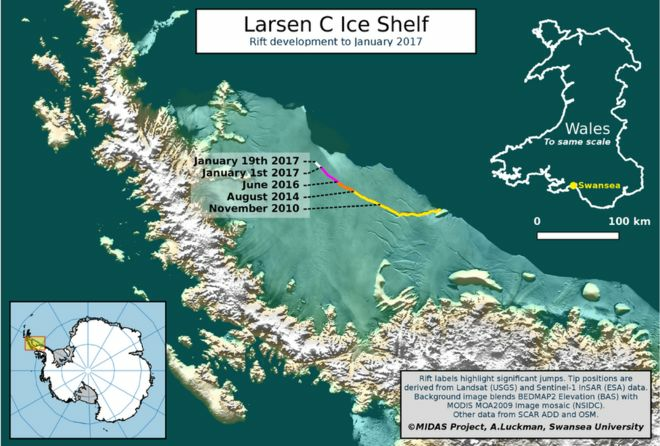 The rift in the Larsen C Ice Shelf has grown a further 10km since 1 January. If the fissure propagates just 20km more, it will free a tabular berg one-quarter the size of Wales. That would make it one of the biggest icebergs ever recorded, according to researchers at Swansea and Aberystwyth universities, and the British Antarctic Survey. News of the lengthening crack in the 350m-thick floating ice shelf on the eastern side of the Antarctic Peninsula comes from the EU’s Sentinel-1 satellite system. Comprising two spacecraft, this orbiting capability can continuously monitor Larsen C no matter what the weather is doing because its radar sensors see through cloud. Their data indicates the fissure now extends for some 175km. But just how long it will take before the 5,000 sq km block finally breaks free is anyone’s guess, says Swansea’s Prof Adrian Luckman. 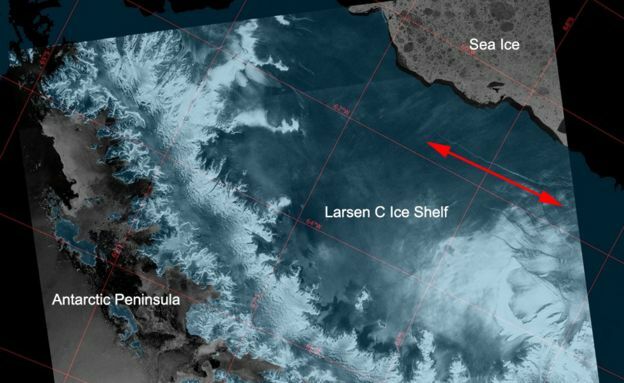 “The rift tip has just entered a new area of softer ice, which will slow its progress,” he told BBC News. “Although you might expect any extension to hasten the point of calving, it actually remains impossible to predict when it will break because the fracture process is so complex. “My feeling is that this new development suggests something will happen within weeks to months, but there is an outside chance that further growth will be slow for longer than that. When the berg splits away, interest will centre on how the breakage will affect the remaining shelf structure. The Larsen B Ice Shelf further to the north famously shattered following a similar large calving event in 2002. The issue is important because floating ice shelves ordinarily act as a buttress to the glaciers flowing off the land behind them. In the case of Larsen B, those glaciers subsequently sped up in the absence of the shelf. 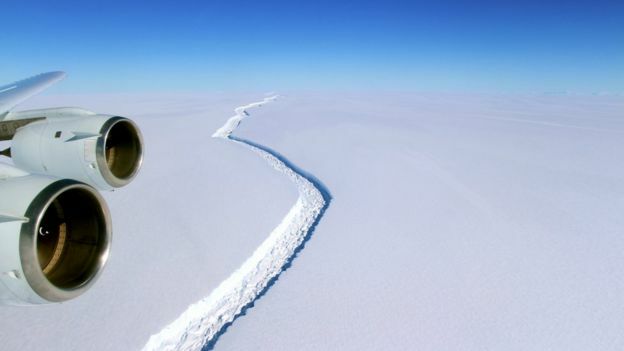 And it is the land ice – not the floating ice in a shelf – that adds to sea level rise. If Larsen C were to go the same way it would continue a trend across the Antarctic Peninsula. In recent decades, a dozen major ice shelves have disintegrated, significantly retreated or lost substantial volume – including Prince Gustav Channel, Larsen Inlet, Larsen A, Larsen B, Wordie, Muller, Jones Channel, and Wilkins. 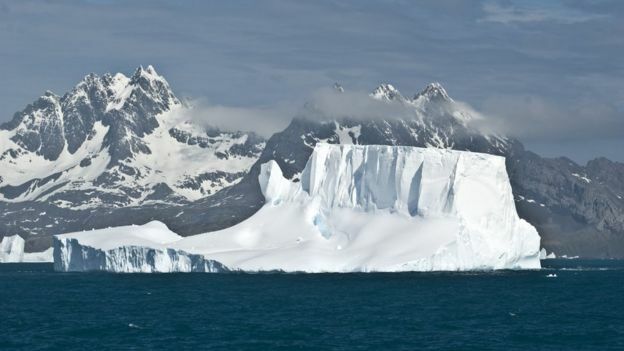 Another development to watch will be the behaviour of the free floating berg, and its progress away from the Antarctic. “Sea ice in the region circulates clockwise with the Weddell Gyre, rather than remaining in one place, and icebergs can be carried with this, sometimes out into the Southern Ocean,” explained Prof Luckman. “It all rather depends on how soon the iceberg breaks up, and how the iceberg draft compares with ocean depths. Many of the big tabular bergs produced in this region of the Antarctic get swept up in currents that eventually take them north towards the British overseas territory of South Georgia. There, they can be caught in shallow waters to gradually wither away. This ocean conveyor is the same one exploited by Ernest Shackleton to get his crew to safety when their ship, the Endurance, was crushed in thick sea-ice in the Weddell Sea in 1916.